Sacramento in the 1920s was an optimistic place, a bustling transportation center served by five railroads (two transcontinental steam railroads and three electric interurbans) and several riverboat lines. The Southern Pacific shops employed thousands of workers building and repairing steam locomotives. Canneries and grain mills turned the Central Valley’s agricultural bounty into packaged products to ship around the world. The success of Sacramento’s first streetcar suburbs, recently annexed into the city, spurred a second wave of suburban development across the rivers in West Sacramento and North Sacramento. Downtown, a growing number of businesses and professionals sought offices close to streetcar lines and government offices. 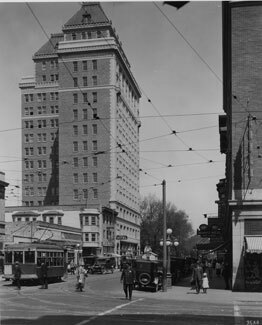 By the mid-1920s, there were already several multi-story office buildings downtown, but the California Western State Life Insurance Building, Sacramento’s first skyscraper, took downtown to new heights of architecture and altitude. The building, known as the Cal-West Building, or simply by its address at 926 J Street, was designed by George Sellon, California’s first state architect. Sellon’s portfolio included San Quentin Prison, the California Almond Exchange, the Hotel Sacramento at 10th and K (long since demolished), and his own home, a Boulevard Park bungalow. At 216 feet tall and 14 stories, the Cal-West was the tallest building in the city when it was completed in 1925. It only held the title for a year, beaten by the 226 foot tall Elks Building a block away. The Cal-West, the Elks, the State Capitol and the Cathedral of the Blessed Sacrament were downtown’s four tallest buildings. They were sometimes called the “Big Four,” a subtle nod to the founders of the Central Pacific Railroad. Built on a steel and concrete frame, the Cal-West building features an exterior of brick and Gladding-McBean tile. The building’s style is a mixture of the simple vertical Chicago School and the elaborate Renaissance Revival. At the building’s peak is a French Chateauesque structure, suggesting an elaborate European chalet set atop a classical pillar. Inside, the building featured copious marble on the main staircase, elevator landings and even in the restroom stalls. An elaborate lobby featured plasterwork by local artisan Thomas Scollan. Such an impressive structure, combined with its modern amenities and central location, drew an impressive clientele. 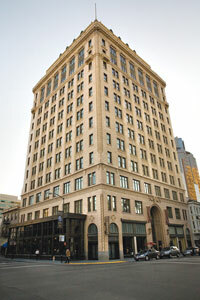 The first six floors were occupied by California Western Insurance, but the other floors featured a mixture of high-profile tenants. George Sellon relocated his offices there, presumably because it provided such concrete evidence of his skill as an architect. Another of Sacramento’s prominent architecture firms, Dean & Dean, had offices here. Charles Dean, the elder Dean brother, had once worked for Sellon during his tenure as state architect. Most of the building’s early tenants were doctors or investment firms. Other offices were rented to national companies who wanted a branch office in Sacramento. Sacramento’s exuberant building boom of the 1920s created many of the city’s most recognizable landmarks. In addition to the Cal-West and the aforementioned Elks building, the Senator Hotel, the Berry Hotel, the California State Library and Office Building 1, the Southern Pacific passenger station and Memorial Auditorium were built during this period. However, the stock market crash of 1929 and resulting depression brought Sacramento’s first high-rise era to a close. While the nation eventually rebounded from the Great Depression, many downtowns failed to return to their old prominence. New Deal era housing policies favored new suburbs over old city cores, and transportation after World War II focused on freeways and sprawling, decentralized cities. As time went on, the building’s unfashionable style and lack of parking made it less attractive to high-profile businesses. In the early 1950s, California Western Insurance sold the building and relocated to a new, low-slung office building on 21st and L Street. By the 1970s, a few doctors and lawyers were still found at 926 J Street, but many offices sat vacant. In the 1980s, nonprofits and advocacy organizations found the building a convenient and relatively inexpensive location for offices close to the State Capitol. The number of activists and political crusaders in the building may be the source of one of the building’s many nicknames, the “Goodie Two Shoes Building,” although that name may be due to the presence of the “Goodie Tuchews” cookie shop, once located on the ground floor. The building’s recent resurgence is due to the work of Rubicon Partners’ Kipp Blewett and Joie de Vivre Hospitality’s Chip Conley. Blewett had experience rehabilitating other historic office properties on K Street, and originally envisioned restoring 926 J to its original purpose as first-class office space, but Conley convinced him otherwise. He had converted several San Francisco residential hotels into boutique hotels, and sought a building in Sacramento for a similar project. The old Cal-West building proved an ideal candidate for conversion. After an extensive renovation, 926 J is now home to the Citizen Hotel, Grange restaurant and Scandal bar. As attention has returned to Downtown Sacramento, the old Cal-West building has found new life in the modern city. The restoration of the Cal-West building is one of many adaptive reuse projects in Downtown. Its nearby competitor the Elks Building is undergoing a similar facelift as an office building, the Roos-Atkins department store and Woolworth’s at 10th and K have become an office condo and a theater, and the Firestone tire store at 15th and L, another 1920s era building, is now home to two nightclubs and a restaurant. However, other landmarks of Sacramento’s 1920s building boom face a less certain future. Some sit vacant, owned by landlords waiting for economic changes that will let them replace the old buildings with new skyscrapers. Others are owned by Sacramento’s redevelopment agency, uncertain what to do with historic buildings other than demolish them. Still others are in disrepair, unsafe for their tenants and considered eyesores despite their potential. They perhaps face the fate of yet another 1920s era city landmark, the Alhambra Theatre: demolition in the name of progress. We can hope, however, that the example set by the rebirth of Sacramento’s first skyscraper will inspire others to follow their example and restore our city’s faded architectural treasures to their former glory. Why isn’t The California Fruit Building at 4th and J the first skyscaper in Sacramento? It was built early in the 20th century, 1910 I believe. Isn’t 10 stories or so enough to qualify? You’re absolutely right, of course–the Fruit Building was a much earlier steel-framed building, of early-skyscraper “pillar” design. But it never had the iconic status that the Cal-West Building (and its johnny-come-lately neighbor, the Elks Building) had on our skyline–those two, along with the tip of the Capitol dome and the cathedral at 11th and K, were known as the “Big Four,” the highest points in the city, jutting up from the valley floor and reportedly visible from as far away as Fulton Avenue. So while the Fruit Building has an earlier heritage, the Cal-West became our first iconic skyscraper–our modest version of the Chrysler Building.